On Wednesday, the Fed raised rates for the eighth time since tightening started. But the KBE Bank ETF — which holds Bank of America and Citigroup among others — failed to rally. This could be a sign of an alarming trend beginning to unfold. “The thing that concerns me is that not only has it been stuck in a sideways range as the market has rallied all year but now in the last couple of weeks it’s dropped below its 200-day moving average. This has been key support for the group,” Maley told CNBC’s “Trading Nation” on Tuesday. 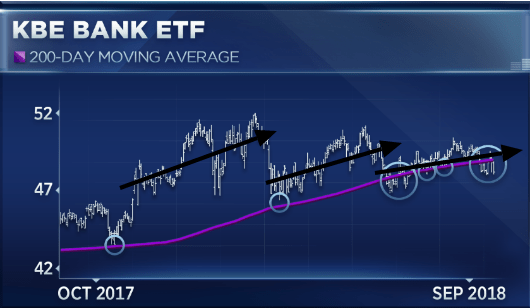 The KBE Bank ETF has dipped close to the 200-day moving average twice, but in recent months has been repeatedly dipping below the average. The KBE Bank ETF has rallied 3 times since October 2017, but each rally has been weaker and doesn’t maintain levels reached since 2017. The black arrows indicate each rally getting more “sideways,” and overall staying sideways after the 3rd rally. This unfolding trend comes at a time “when things should be positive for the group,” according to Maley’s analysis. At the time of this writing, all bank share prices in the ETF were still dropping, some over 2%. It’s “boom or bust” for the banks, according to the CNBC report. Will This Economic Reality Finally Get the Fed’s Attention? Even in the face of flattening big bank stocks that dip below critical averages, Chairman Powell would prefer to have you believe everything is just fine. This may seem like a good “moment” for the U.S. economy, but only if you don’t look below the surface. Despite this, the Fed upgraded the economic outlook. Of course, higher interest rates are designed to cool down the economy, so however good the economy is (or isn’t) right now, the rate hikes are supposed to “normalize” the market. Case in point: Eight rate hikes since 2015 come with cumulative ripple effects like higher monthly payments, more expensive loans, and a slowing mortgage market. And a fourth rate hike for 2018 is already priced in for December, with more right around the corner. Don’t expect bank savings or CD’s to pay out much higher either, those are stagnating around 1 – 1.5%, despite Fed hikes. You’ll have to go down to a community bank to get anything close to 2%, according to Paul Davidson in another USA Today report. That’s reality, whether Chairman Powell wants to acknowledge it or not. Since the Recession a decade ago, the Fed doesn’t seem like it wants to face the reality of another severe correction. So they bailed out big banks. They dropped interest rates to near-zero, and they injected billions of dollars of liquidity into the financial system. 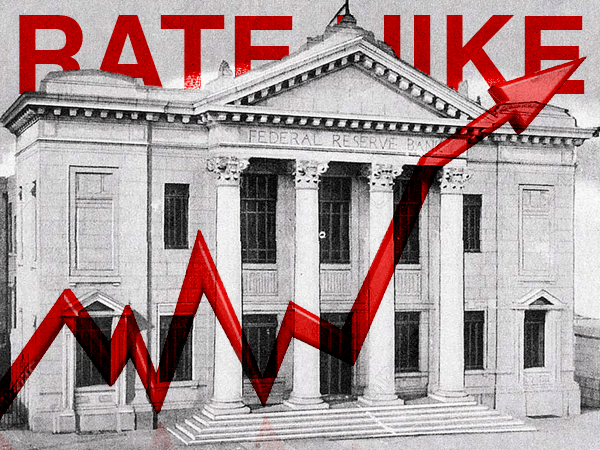 Now they’re raising rates at an alarming pace, with several more rate hikes imminent. Inflation is on the rise, and who knows where unemployment may be heading. Plus, credit is vital to the U.S. economy, and it’s likely to get expensive. Then you throw in trade war tension, mortgage bubbles, and increasing junk debt. All of these signs taken together point to a near-term market correction. And this time it could be more severe than the “mini-correction” the U.S. suffered in February 2018. Especially since the “script” is eerily similar to a decade ago. That means the ride is about to get bumpy. Make sure your portfolio can handle it.